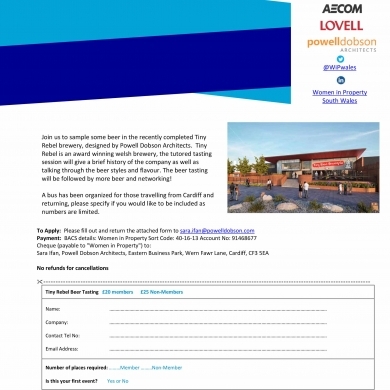 Powell Dobson are delighted to be sponsoring the next Women in Property South Wales region event on Thursday 13th September 2018 at the Tiny Rebel Brewery in Newport. The event will consist of Beer Tasting followed by networking of attendees. Bus transport will be provided from Cardiff at 4.30pm and the event will start at 5.00-5.15pm at Tiny Rebel. Please contact sara.ifan@powelldobson.com for any further details or to book a space at this event. Tickets are £20 for members and £25 for non members.